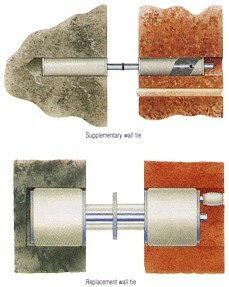 Wall Tie Replacement, CardiffBlack ash mortar was used in the construction of many houses in Cardiff and other regions in the United Kingdom. Ingress of moisture through the external brickwork leaf and mortar causes the formation of acidic agents which cause corrosion of the wall ties. Particularly at risk from corrosion are the zinc-coated wall ties which have been traditionally employed in UK housing. The CINTEC RAD replacement wall tie was specifically developed to overcome the problems associated with black ash mortar and tie corrosion. Removal of the existing wall ties is the preferred solution because if the wall ties are bent-back further corrosion can lead to damage to the finishes on the internal skin of brickwork, due to the expansive forces caused by the corrosion. The existing ties were located using a metal detector. They were over-drilled using a 60mm diameter over-coring drill and removed. The 60mm diameter CINTEC RAD anchor was installed based on 10 x 1mm CHS stainless steel section with socks at either end in the external and internal walls. Grout was injected under pressure and the external skin was made good to match the existing brickwork.